Sedans in America are going the way of the clutch pedal unless you are Subaru. The Japanese automaker just released full details on their all-new seventh-generation Legacy sedan and they threw in quite a few surprises for the 2020 model year. Here are the details and copious upgrades over the previous generation model, and why you might want to rethink buying a sedan. Subaru could pick up new customers from all those other automakers who have decided to ax their sedans and go with an all-SUV line. Subaru could have the last laugh because the Legacy is still the only sedan with standard all-wheel-drive all-weather capability. It’s one thing no other automaker offers. Subaru made so many improvements for 2020, it could revive this nameplate, and consumers still wanting a sedan will have a good option in the Legacy. We knew the seventh-generation model was coming with the new Subaru Global Platform that will improve driving dynamics, safety, and reduced cabin noise. What we didn’t know, Subaru engineers increased structure stiffness by 371-percent (compared to initial iteration of the Subaru Global Platform) and, for the first time in any Subaru vehicle, it gets a floor cross member that is filled with a highly rigid and lightweight two-part foam material, and an all-new suspension that is lighter, stronger and more responsive. For the first time since 2012, the Legacy lineup will feature a turbocharged engine. Subaru offers Legacy in a new XT model, using the Ascent family hauler’s 2.4-liter turbocharged BOXER engine. Legacy still gets the standard 2.5-liter engine, but it gets increased horsepower (+7=hp) and (+2 lb-ft) of torque over the outgoing model and gets a one mpg increase to 35 mpg. We reported here one year ago, Subaru would discontinue the larger 3.6R six-cylinder trim. 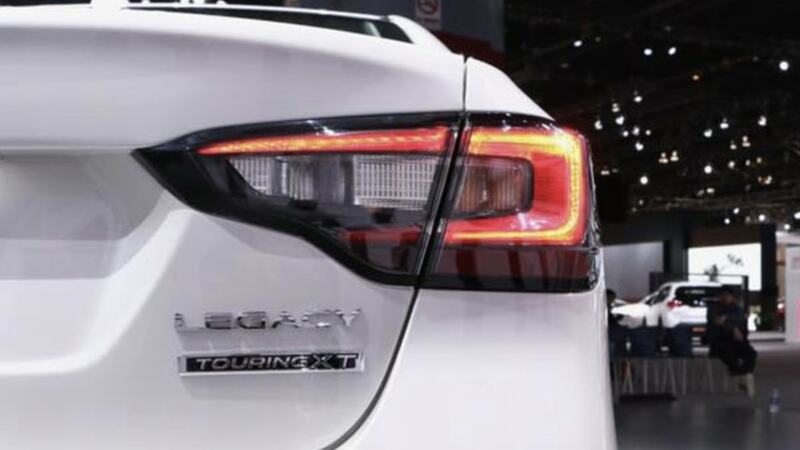 The Legacy now utilizes a full inner frame construction for the first time that is significantly stiffer and lighter than the previous Legacy’s conventional structure. Subaru says Legacy’s stiffened platform, and strengthened suspension will lower the center of gravity, providing more responsive steering and handling, a smoother and quieter ride, and heightened hazard avoidance in emergency situations. The new sedan’s crash protection is also improved, as the new body absorbs over 40-percent more energy in front/side crashes than the current model. The new 2020 Legacy will be the safest sedan on the road. Subaru’s EyeSight driver assist technology is now standard, and Legacy is equipped for the first time in the U.S. with a Lane Centering Function. The new function provides steering assist when the vehicle veers outside its lane, helping the driver maintain a direct path. Legacy also gets the DriverFocus Distraction Mitigation System that made its debut on the new 2019 Forester. In another Legacy first, the 2020 model offers a Front View Monitor that captures images within the driver’s blind spots in front of the vehicle and displays a 180-degree view on the 11.6-inch display, providing safety and assistance when checking road conditions ahead or parking. Subaru didn’t forget about the cabin either. Highlighting Legacy’s upscale interior is an all-new tablet-style 11.6-inch full HD multimedia display, the largest, most advanced infotainment screen ever in a Subaru. The cabin is larger and offers more legroom, (features 41.1 inches of rear legroom-more than Accord, Camry, Altima, Malibu, and Sonata) and features higher-grade materials, and the new Legacy Touring trim offers genuine Nappa leather. Plus, it features a heated steering wheel, heated and ventilated front seats, and heated rear seats. Legacy offers in-car Wi-Fi connectivity for the first time providing internet access via high-speed LTE communications, broadening the range of entertainment options available to rear-seat occupants using smart devices. Subaru says the new Legacy cabin is almost 3 dB quieter at highway speeds over the outgoing model. Subaru engineers found ways to reduce unwanted noise coming into the cabin by fitting the Legacy with new door weatherstrips that feature a baffle in the mid-section and dual lips on the roof side for improved quietness. Outside, Legacy gets modest styling upgrades with wider fenders and a higher trunk surface. When all these upgrades and improvements are added up, you might want to rethink buying a sedan. You can check out the all-new seventh-generation 2020 Subaru Legacy at the Chicago Auto Show. The Legacy will arrive at Subaru showrooms this fall, with pricing announced closer to dealer launch. Stay tuned. "We reported here one year ago, Subaru would discontinue the larger 3.6R inline six-cylinder trim." ... You might want to correct that lol. It was never an inline 6. Now, if Subie gives us the wagon, an STi version, and the option of a manual, I will stop my string of 4 BMW 5-Series and 10 MB S & E class purchases. There’s a market for the forbidden fruit of US bound E53 Estates and T6 V60 CC’s! And if they only make it low enough so you don’t need a step ladder to put your bike and kayak on, we will finally get back to what made stubbies great in the first place. Otherwise, the V60CC.